Can’t Stand the Heat? Out of the Workplace! Say your workplace team is tasked with creating a meal. What would happen next? Would the boss start delegating? How about YOU? Would you claim your expertise? Express your taste preferences? Facilitate the planning? Jim & Steve get an inside look at the Weber Grill Academy, which helps teams learn about each other through cooking together. Voiceover: It’s a Northwest lifestyle weekend on KOMO news. Now a show for anyone who is or has a boss. This is The Boss Show with Jim Hessler and Steve Motenko. Jim Hessler: Because only the Danish are capable of answering this question. Steve Motenko: Exactly. We had to search throughout the world and Copenhagen is where we landed. Actually, this man is a manager of the Weber Grill Academy, he creates team-building experiences through the wonderful process of cooking together. I’m curious if you have had experiences in cooking together, how does that… how has that looked like, or not looked like working in an organization? That’s what we’re going to be playing with today. Welcome to the show, I’m Steve Motenko, I’m The Psychology Guy, I’m a Harvard educated leadership coach here in the Seattle area and I do leadership development work in organizations with my friend across the table. Jim Hessler: And that’s me, I’m Jim Hessler. I’m the business guy, I’m the founder of Path Forward Leadership Development, and the author along with Steve, of the book Land On Your Feet Not On Your Face. This is the show for anyone who is, or has a boss. Steve Motenko: Who’s the father of the theory of evolution? Jim Hessler: Well, I know the obvious answer is Darwin, so that must not be who it is. I think there was a Frenchman if I’m not mistaken, who might have beaten him to the punch but didn’t publish. Steve Motenko: I don’t think his…you’re right, but I don’t think he was French, because his name was Alfred Wallace. Jim Hessler: Oh, okay, alright. Maybe he was Danish. Jim Hessler: Of course, it’s biblically important if it’s from Harvard. Steve Motenko: It must be right. A recent study basically says that what we tend to think of as the work of individual geniuses, most of the innovations that have come our way in the past number of centuries, that we tend to think of as the work of individual geniuses, are actually, arise through societies and networks of people acting in a sense as collective brains, as opposed to individual brains. Jim Hessler: Absolutely. And we even see that in the arts. We see how these people tend to congregate in places. Thinking of a scientific version, another scientific version of what you’re talking about, Einstein. There’s no way Einstein could have developed that out of whole cloth. There were a lot of other people who had led him to his discovery of the theory of relativity. But also, any sort of creative or scientific enterprise tends to operate, tends to come out of a community of some sort. Jim Hessler: We see that right here in Seattle with the tech industry. Jim Hessler: I mean there’s a reason they all want to be located in certain cities. There’s just a lot of really smart people bouncing a lot of really great ideas off of each other. Steve Motenko: You know, it occurs to me we talk a lot in our leadership workshops about the dangers of the hero mentality, right? The one person whose got the tribal knowledge all within him or her. Steve Motenko: And how dangerous that is to the survival of the organization and the mission if that person gets hit by a bus, or leaves for another company or whatever. But it’s not only that. It’s that the hero is not the hero that we think he or she is. That there’s always this huge support structure, often though invisible, beneath him or her that’s created, that he or she is just like the kinda final manifestation of. So it’s really the team that creates ideas. Jim Hessler: The one area, I don’t want to confuse the issue here, because I also know that there’s never been an example, for example, of a classical musician, I may have mentioned on previous shows. There’s never been an example of a great symphony that’s been written by two people. Steve Motenko: Simon and Garfunkel. Jim Hessler: That’s words and music. A little different. We have examples of where you can listen to a great piece of music and hear the influences of other musicians. I mean, you can almost tell who their teachers were. Steve Motenko: Sure. Yep. Mmm hmm. Jim Hessler: And who they hung out with by the influences. So there’s still a role for somebody sitting in a quiet place doing something intensely creative. But just recognizing that that’s never actually done alone. When they walk into that space, they’re bringing a lot with them from other people. Steve Motenko: Right, of course. And to bring it to the workplace, independence is critical. You don’t want to have a team full of people who are just waiting for other people, for the group to come of the collective to come up with ideas. You need independence, you need drive, you need ambition in a positive sense, you need self-actualization, but it’s all gotta happen within an interdependent context. Jim Hessler: But isn’t, mister psychology guy, isn’t there a style issue to a certain degree here as well? Some people create better in a group setting? And some people might not? Steve Motenko: Yeah, absolutely. It’s an introversion extroversion thing. Jim Hessler: Possibly to some degree. Jim Hessler: Even as an introvert though, I enjoy creating in group settings. Jim Hessler: Big white board guy, and post-it notes and throw ideas on the wall. I like that sort of thing, and I’m an introvert so. Steve Motenko: Yeah, and my style is different in a way. I like sitting and reflecting on my own, and I need to stretch myself to do more of that collective work. But it’s critical. And that’s why I need to stretch myself. You’ve got to embrace diverse perspectives. I mean this is common wisdom these days. But there’s a lot more grounding under it now, the understanding that innovation requires bringing different pieces to the table in an atmosphere where failure is an opportunity for learning as we quite often say people are not afraid to take risks. Jim Hessler: And American culture, I think is still very heroically based. We tend to look at individual heroes and idolize them and make them the object of our adoration and our interest. Steve Jobs, I think, may be a good example of that. Steve Motenko: Yeah, there are a lot of great examples of that. I think we’re a much more individualistic culture than most cultures around the world. It maybe comes out of this pioneering spirit. But I think it’s led to a misunderstanding of what really works to move things forward. So one of the things that this paper said in kind of summing all this up is to be an innovator, I’m quoting this paper from the London School of Economics and Harvard. To be an innovator, it’s better to be social rather than smart. Which really kind of flies in the face of conventional wisdom, doesn’t it? Jim Hessler: Yeah, I mean why does it have to be a better than? Why can’t it be an and? Jim Hessler: I mean, clearly to have some sort of meaningful creative process going on you’ve got to have to have smart people in the room. Steve Motenko: Right. And I think that’s fair. Steve Motenko: So, teamwork being critically important and in July of last year, 2016, we did a show on creating the ideal team that you might want to check out in our archives on thebossshow.com, and Jim you remember last year when we took my father-in-law to Sweden for…his birthplace in Sweden for his ninety-fifth birthday. Jim Hessler: Yes, there were some, quite some stories you told me about that trip. Steve Motenko: Yes, many of which are not fit for radio. Jim Hessler: Yes of course. Jim Hessler: There you go. Steve Motenko: And introduced us…introduced my wife and me to our next guest. And that is Kristian Jorgensen who is the manager of the Weber Grill Academy, who is joining us all the way from Copenhagen. Kristian, welcome to The Boss Show. Kristian: Well, thank you very much, and thank you for having me and remembering me. Steve Motenko: Yeah, well, I can’t not remember you, because we had such an interesting conversation about the team building events that you created at the Weber Grill Academy. Real briefly, what is the Weber Grill Academy. Jim Hessler: Just to eat. Kristian: Say the same sentences last time you were out to dinner, and you’re narrowed down to the people sitting next to you. So what we wanted to create is a place where you actually get to talk to your employees and your colleagues, and what’s actually going on at our place is that our guests they come in, they have snack and an apartif, and they settle down at our place and we then divide the guests up into teams. When they go to the kitchen where we challenge them into a competition where each team needs to prepare a three course dinner on charcoal grills. Steve Motenko: And who judges the competition? Kristian: On the initial part and how each item is prepared. Steve Motenko: So what really intrigues me about this is what happens in the dynamics of these teams of people, who are engaged in this competition. Real quickly, how many are there on each team on average? Kristian: Well, on average we have about 8 to 10 people on each team. Steve Motenko: So Kristian, what does happen, socially, when you grill food with your colleagues or employees? What do you notice? Jim Hessler: Nobody knows more than anybody else knows. Kristian: All of a sudden the boss he say, the leader, he’s leveled out and everybody in some kind of flat structure and they need to build up this performance together, where they prepare each course and actually learn a lot about how companies work the best because if you see…if you have a leader who’s all of a sudden is on the same level as the employees, and they build something up together, you see that the ownership, and the willing to do something together is increasing by a hundred percent. And I think our response from the companies is that they actually learn a lot, and they actually see each other in intimate moments through something as simple as grilling food, and when you come back to Monday morning on a normal work day, they actually have something to talk about and the ownership from the employees is increasing, because they see the leader in an intimate situation. Steve Motenko: Do you find…do you see that bosses often are kind of struggling to maintain control or authority in a situation where it’s really hard for them to have it? ‘Cause again, they don’t know the kitchen, they don’t know the grills. They don’t have the experience. Kristian: Well, occasionally we see the bosses, they struggle to maintain the leader role, but within 10 twelve minutes they realize that it’s a fight that they cannot win, so they actually lay flat on the back and they say okay you know what? My boss role is eliminated, so we have to work together, and they realize that in a situation where they need to grill with people you don’t know in a kitchen you don’t know, with employees there are no leaders, because maybe sometimes one of the maintenance guy has six Weber grills at home and he grills every day. Kristian: And the leader, he has a fancy kitchen at home, but he goes out for dinner every day. Steve Motenko: Or he hires a maid, or a cook to cook for him. Steve Motenko: Tell us what you notice about individual personality styles in the context of these cooking competitions that you put people through. Steve Motenko: The carrot peeler. Kristian: All of the things that have been done, big or small. Steve Motenko: Is this a metaphor for the workplace or what? Jim Hessler: Yeah for sure. Steve Motenko: I love this. What else? Kristian: They haven’t brought anything to the group. Kristian: Just by peeling a carrot, we can see the person has a feeling of coming back and we see that the group always welcomes the person just by doing really, really small things. One of the funniest stories that we see is that we have this…we have that lawyer company where nobody said anything, everybody was quiet, nobody did anything for each other. And I think that’s the hardest group we ever had, and I asked them afterwards did you guys have fun? Did you enjoy it? And everybody said yes. And I dared myself to ask them, nobody said anything. How come? And they actually told me, you know what? We are lawyers, and we don’t do anything without getting fifteen hundred dollars an hour. So that’s actually the hardest group we ever had, but what we usually see is that it doesn’t matter if it’s international CEOs or if it’s a Swedish hardware company coming to our place, we see this feeling that people get when they prepare food together and when they create something together as simple as food, that that actually brings a lot of joy and a lot of things to talk about when they come back. Steve Motenko: So we’ve only got about thirty seconds. What can you say about competition as people relate to competition about losing or winning the competition? Steve Motenko: Sorry Kristian, with that we’ve got to leave it there. Thanks so much for joining us on The Boss Show, especially late in the evening, your time. Jim Hessler: It just occurs to me next week we’re going to be doing a show on how management can stay connected to their employees, and it was really interesting to hear how when you put yourself in situations where your authority, and your knowledge, and your experience are worthless, it actually creates a connecting opportunity with your employees. It’s a very kind of democratizing environment. Steve Motenko: Yeah, well said. And it demands for the people kind of step up, and Kristian said that they do. 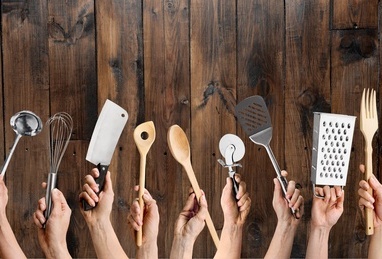 Jim Hessler: Yes, and so anytime you can find an opportunity to cook together or do something where you’re not the expert, it can humanize you, and connect you, I think, in a better way. The Boss Show is produced by Path Forward Leadership, and our sound engineer’s Kevin Dodrill. Steve Motenko: If you missed any of the show, you can get it in its entirety online at our website thebossshow.com. That’s also where you can go to subscribe to the podcast, also available on iTunes, Stitches, and Soundcloud, and to contact us, maybe to bring us into your workplace. Jim Hessler: And thanks for listening.